ISIS carried out explosive attacks in Baghdad and its environs to undermine an increasingly fragile Iraqi government through April and early May. The group exploited a security system both distracted by ongoing political upheaval caused by a stalled reform and burdened with protecting thousands of Shi’a pilgrims travelling to northern Baghdad for a major Shi’a holiday. "Flexibility Key to U.S. Withdrawal from Iraqi Cities"
For the first time since the start of the war, American forces are withdrawing from Iraq’s cities, reducing their numbers and turning responsibility for security over to Iraqi forces. 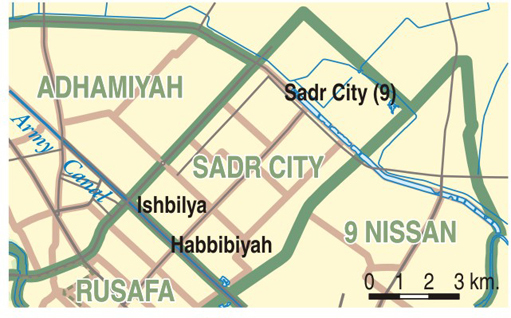 Read more about "Flexibility Key to U.S. Withdrawal from Iraqi Cities"
Jaysh al-Mahdi, or JAM, is the militia of the Sadrist Trend. 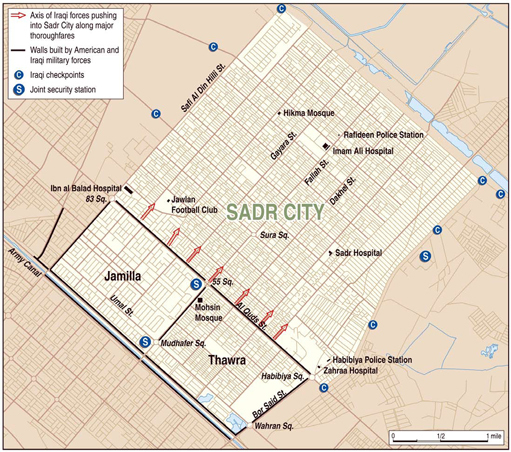 Marisa Cochrane briefs on Iraq Report 12: The Fragmentation of the Sadrist Movement. This Google Earth file maps Multi-National Force-Iraq press releases on activity by and against Iranian-backed Special Groups. Read more about Moqtada al-Sadr's "Resistance Cells"